KATHMANDU, Nov 23: The commission formed to restructure local units under the new federal system has decided to begin the task of determining the number of local units and their boundaries in the eight districts of Province 2 [eastern Tarai] from next Sunday even if the Madhes-based political parties did not cooperate in the restructuring task. Officials of the commission said that the commission decided to begin deliberations on fixing the number of local units in each of the eight districts from next Sunday as part of the commission's plan to submit its final report to the government on November 30. "We already waited too long seeking cooperation from the Madhes-based parties. But we cannot wait any longer as we have less than a week to submit the final report. So, we have decided to begin the process of local restructuring in the eight districts from next Sunday no matter what," Sunil Ranjan Singh, a member of the commission, who is also in-charge of Province No. 2 of the commission. He said that the technical committee in all the eight districts -- Parsa, Bara, Rautahat, Mahottari, Siraha, Saptari, Dhanusha and Sarlahi -- will issue a public notice within two days urging the political parties to take part in the deliberations to be held from Sunday. "From Sunday, our technical committee will sit with representatives of political parties who will come for deliberations. The technical committee will forge a consensus on a certain number of local units to be formed," he said. He said that the commission from the central level will guide its technical committee to reach an understanding on the number of local units. "And even if the political parties fail to reach an understanding, the commission will use its rights enshrined in the constitution and fix the number of local units for the eight districts," Singh said, adding, the technical committees in the eight districts have already collected necessary information and completed other necessary tasks to be done to finalize their report. The commission has also informed the government about beginning the restructuring task in the eight districts of Province No. 2. 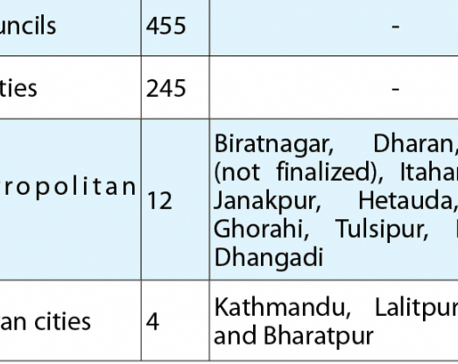 As of now, as many as 64 districts have submitted their reports while Nawalparasi, Rupandehi and Rukum are in the final stage of submitting their reports.